First of all I want to say that we recently launched a new website just for our planks, so feel free to head on over there to check it out. Do you want to spark your child’s creativity? Do you want to encourage patience and problem solving? We haven’t found a toy yet that will encourage ingenuity and creativity like wooden building planks. My husband made these for our sons several years ago. They have spent countless hours with them and surprised us with the many uses they have discovered for them. Many of our friends asked about them so we decided that we would make them available for others to buy in our shop here. 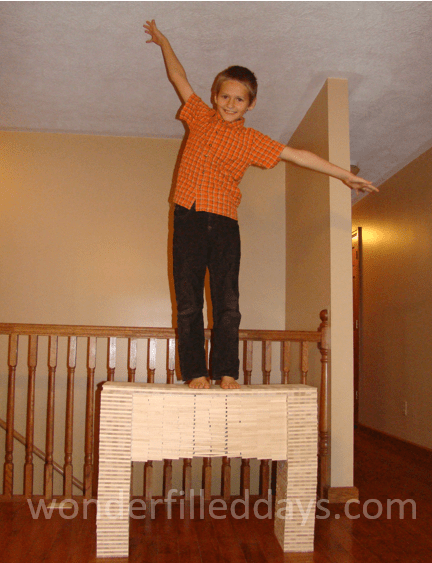 What can’t your child make with 1,000 identical wooden planks? How long of a free span bridge is it possible to make using just 4 1/2 inch planks? It ended up much longer than I thought possible. And just recently they completely amazed me with this two-foot bridge (inside dimensions) that could support their weight. There’s a fast motion video below of them building it. How many blocks do you think it’s possible to stack on top of one plank standing on end? We thought it would take them a long time to get to twenty. Our son surprised us by stacking 600! What you can build is limited only by your imagination. Here are some other projects the boys have worked on. Here’s a video showing our boys building a two foot bridge that ended up supporting almost 200 pounds. And here is a video of a really neat controlled demolition of a wall my son made. Visit our store for options and pricing. And we’d be grateful if you would share this page if you think your friends would be interested. Thanks! We have these and they are awesome. My sons and any visiting children spend hours playing with them. Definitely a worthwhile investment. Yes, aren’t they so much fun?! I keep looking at the picture of the 600 blocks balanced on the one…..that is quite incredible. We’ll have to try that some day soon. It takes a lot of patience. Good luck! These look amazing! How big is one plank? And are they very heavy? They are really fun! 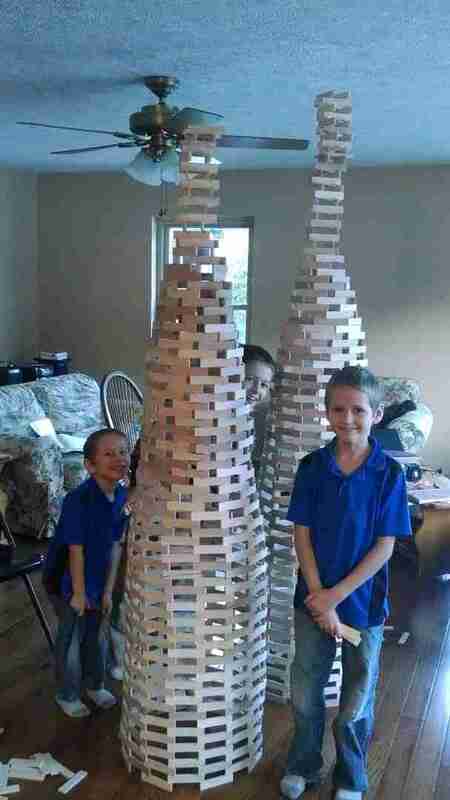 Even adults like building with them. One plank is approximately 1/4 inch by 1 inch by 4 1/2 inches. One plank isn’t heavy but the weight adds up. I can let you know how much the different amounts weigh if you’d like. ha, ha, ha, a big domino version ! amazing ! That’s a lot of the fun. It’s so much fun to see them fall. My kids have some planks like these. I’ll have to show them some of these pictures for inspiration! Love it! I hope they have fun with some of the ideas! My favorite growing up was K’nex, but there’s some interesting physics being displayed with these planks. Cool! The boys have made some structures that I didn’t think were possible. The first time I saw a bridge that spanned more than the length of one plank, I thought, “Now how did they do that!” We’ve had K’nex and they’re fun, too.